Brisk and chilly easterly with, at times, a touch of south in it for us on Sunday 14th April. Sensible course of I to E set by Trevor and John Dunman, giving an exciting run up river. Only three takers David Solo, Brian Laser and me with Timmy Enterprise. Close racing throughout with all three always close together. The Solo and Enterprise swapped the lead four times with the Laser close behind, usually the Solo taking the front on the run and the Enterprise on the beat. The Solo had it when the Enterprise had an ‘oh dear’ on the penultimate gybe, taking in a few gallons of Thames. In the afternoon there were three Enterprises, Ian with Susie, Sophie and Jane and me with Timmy. The wind had moderated a tad but there were moments. Ian and Susie worked their way to the front and won by two boat lengths. Three GP’s out John and Ali, George with Chris and Keith with Susan, another close contest ensued. Just one Merlin with a welcome return of Simon with Claude. Lots came to HSC afternoon tea club which was well handled by Chrissy and Annie. Time was by Alison and Peter Harley. Nigel addressed us about forthcoming events – also see your beautifully presented new programme-and that was it. 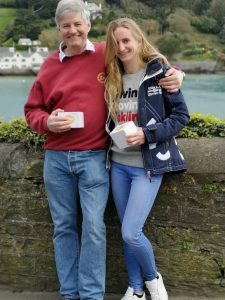 Congratulations to our entries in the Merlin event in Salcombe who braved some rather windy conditions. For a very honest video from Tracy Edwards see the RYA website. Many congratulations to Hwyel (Snr) and Lucy Penwarden for winning the Merlin Salcombe Silver Tiller (Bronze Fleet). See you all next week, there was some talk of an Easter Egg Hunt but there might not be anyone young enough for it. It was agreed Timmy no longer qualified! A too tell er Philip.